Halloween is not far off. And while in the UK we may still be in denial that it’s becoming more and more commercialised, the statistics speak for themselves. A 2017 report by Mintel, predicted consumer spending on Halloween goods was set to reach £320m last year – and much of that would be fuelled by adults and Millennials, confirming that the season is not just about children’s trick or treating. Almost half of all consumers now say they spend money on Halloween, with one in six spending more than £50, and sweets or chocolates head the list of items most likely to be purchased, with the inevitable pumpkins and fancy dress items next in line. Enterprising retailers and consumer brands are also tapping into the evolving trends in shopping tastes, with consumers preferring in-store ‘experiences’ to price promotions. This has led major beer and soft drinks brands to vie for the strongest association as ‘the’ drink for Halloween parties or fun events, with multi-channel promotional tactics that include fancy-dress pop-up shops and downloadable themed Snapchat frames for those all-important scary selfies. There’s even a growing belief among big brands that engaging well with consumers at Halloween can lead to better sales in the final quarter of the year – so a healthy Halloween could stand you in good stead for a cracking Christmas. So are there any lessons for small businesses from these big-brand trends and tricks? If you’re a retailer, probably the most obvious and easily replicated would be the experiential approach. Whether you have a flower shop or a greengrocer’s there’s always something you can do with a colourful, eye-catching display – you decide how gory to go. Bars, restaurants and coffee shops can offer Halloween-themed menus or treats, or encourage customers to celebrate the season with a group of friends while you provide the scary ambience. 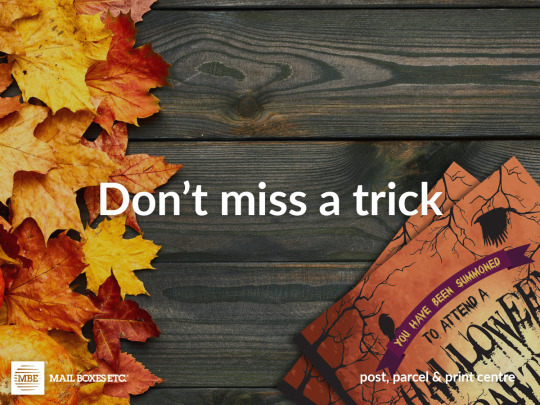 For other businesses, Halloween can be a great hook on which to hang your new customer prospecting drive – use a little humour to pep up your monthly Mailchimp campaign, whether it’s with a spooky headline or a bat-infested landing page. You don’t have to offer discounts or gifts – just turn a few heads with colourful artwork and show your playful side. Once you’ve got their attention, you can get your message across that much more effectively. Halloween is a great excuse to use colour and break out of your normal branding guidelines. 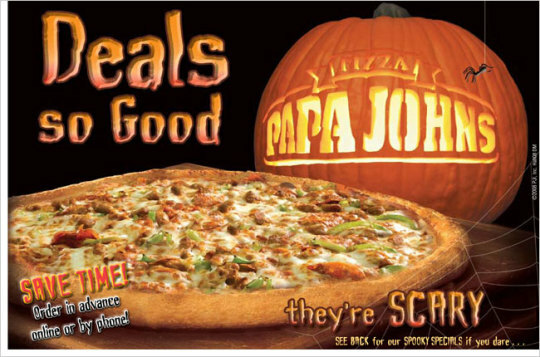 If you have a high-street presence, grab your customers’ attention with posters, banners, or even scary standees. Once they’re in-store, make sure they take away a flyer that reminds them to come back soon. If you’re non-retail, why not make your company memorable by sending your customers a few Halloween-themed chocolates and a quick reminder of your products or services? And remember the big brands’ approach to locking down that all-important relationship: take the opportunity to leverage Halloween as a lead-in to the Christmas run-up period. If you’re stuck for ideas on designs or themes, why not pop into your nearest Mail Boxes Etc. store to chat through some options with one of our in-house designers? And remember, we can make your cute pumpkins or gory ghouls come to life in glorious saturated colour, whether it’s postcards, flyers, leaflets, posters, banners, window clings, menus or gift boxes. And of course, we can send them for you too. 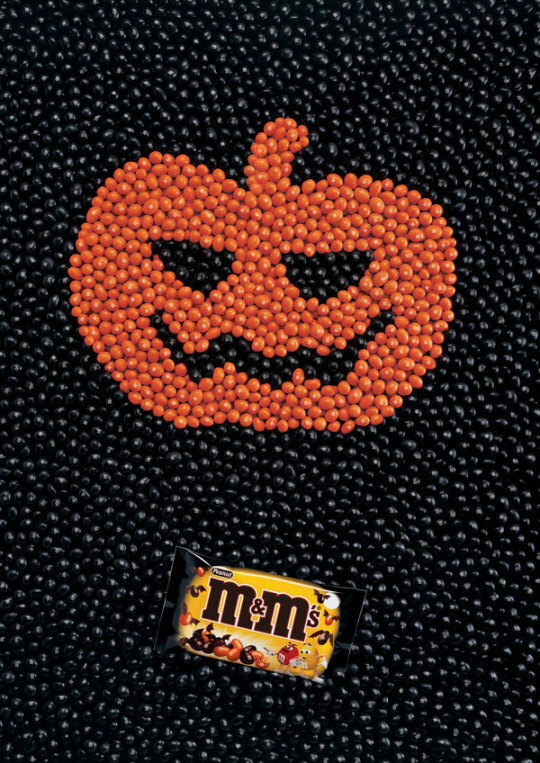 Halloween doesn’t have to be scary – own the opportunity and let your imagination go crazy!